Featuring Local and Regional Artists from the Blue Ridge Smoky Mountains. Authentic mountain towns, lined with antiques, galleries, specialty shops and eateries. Discover the East's king of waterfalls. Watch it cascade over massive rock pillars and drop 411 feet to the river below. A Cascading Beauty. 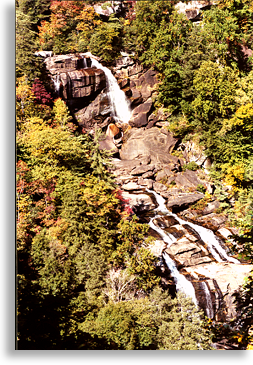 Whitewater Falls owes its existence to the Blue Ridge Escarpment, a sharp drop in elevation between the mountains and the Piedmont. With a 411-foot plunge, Whitewater Falls in North Carolina is the highest waterfall east of the Rocky Mountains. South Carolina's Lower Whitewater Falls drops another 400 feet. Reflecting the escarpment's steep, rugged terrain, much of the Whitewater Falls area receives few visitors and has remained wild and undeveloped over the years. In the cool, moist shade of steep slopes and rock cliffs, wildflowers and salamanders abound. This wild land is also a perfect haven for a rich array of ferns, mosses, and fungi. Enjoy the beauty of blooms and berries through out the seasons. Directions from Cashiers: Drive south on NC 107 for 9.3 miles. Shortly after crossing the State line, turn left at the sign for Whitewater Falls. Continue 2.3 miles to the intersection with SC 130, which becomes NC 281 at the North Carolina State line. Just beyond this point is a sign for the entrance to Whitewater Falls. The Whitewater Falls Recreation Area is open from dawn until dusk year-round. 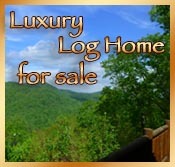 The area features awesome views of Whitewater Falls and Lake Jocassee. Picnic tables and shelters, flush toilets, and ample parking are available. Under the present fee program, up to 80 percent of the collections help fund improvements at this site. These improvements can range from trail construction to rest room renovation. To be safe, never wade or walk on rocks above the waterfall. Even when dry, the rocks are extremely slippery, and a slip can be FATAL! Viewing these waterfalls from a distance is safer and provides better views. At the Whitewater Falls Recreation Area, the following regulations are in force for your safety and to protect the environment. Stay behind guard rails and caution signs. Stay on the trail. Avoid shortcuts, climbing on boulders, or walking on plants along the trail. Leave flowers and plants so others may enjoy them and so plants can generate next year's flowers. Picnicking is welcomed, but please place garbage in trash cans. Visitors may not drink or carry alcoholic beverages. No camping or campfires are permitted within the Whitewater Falls Recreation Area or anywhere within the Whitewater River corridor. Report hazardous conditions to the host in the trailer parked across from the rest rooms or to the Nantahala Ranger District office at (828) 524-6441. For an excellent view of Whitewater Falls, follow the paved walkway to the upper overlook. The walkway begins at the end of the parking lot and is accessible to people with wheelchairs. A lower overlook is located at the bottom of 154 wooden steps. More energetic hikers can continue elevation to the Whitewater River and Foothills Trail. With the exception of the two overlooks near the top, no other views of the falls are offered. The best views of the falls are from the two overlooks. However, some people venture off the trail to try to get better views. Tragically, several of these people have fallen to their deaths or suffered serious injuries at Whitewater Falls. The Foothills Trail stretches along the Blue Ridge Escarpment 85 miles. After descending the spur trail, hikers may travel the Foothills Trail to South Carolina, Lower Whitewater Falls, and other east and west points. Foothills Trail Conference volunteers provide the majority of trail maintenance. The conference's board includes representatives of managing agencies and landowners. The Nantahala Ranger District of the Nantahala National Forest manages a 4.5-mile segment of the Foothills Trail from the NC-SC State line east of Whitewater Falls to the NC-SC State line, west of the falls. Starting from the Cherry Hill Recreation Area, a moderate 2.7 mile trail affords views of the biggest drop on the Chattooga River, a rumbling 30 foot hydraulic known as Big Bend Falls. Even though this is a mountainous locale, you will find the hiking on this trail is fairly straightforward. Red blazes guide you through a predominantly hardwood forest of hemlocks, white oaks, mountain laurel, and galaxy. The Big Bend Trail runs parallel to Big Bend Road (FS 709) for some distance and eventually ends at a junction with the Foothills Trail. You need to hike approximately .6 mile south on the Foothills/Chattooga Trails ( the Foothills and Chattooga Trails ron concurrent in this area) for a nice view of Big Bend Falls from a ridge overlooking the river. Directions: From Walhalla, drive west on SC 28 for 7.5 miles and veer right onto SC 107. Drive 8.8 miles to the Cherry Hill Recreation Area on the right. The trailhead is just south of the entrance to the recreation area. Aptly named, Fall Creek is home to three waterfalls, each roughly 30 to 50 feet high in a mile-long stretch. The less intrepid can enjoy a fine view of the first level just below the west side of FS 722. But to explore the entire Fall Creek chain--including the third level, budget about 2 hours for the difficult, two-mile downstream hike. There is no marked trail and dense rhododendron thickets blanket each side of the creek. Directions: From Westminster, drive west 16.2 miles on US 76 and turn right (east) onto Chattooga Ridge Road (Oconee County S-196). Drive about 2.2 miles and turn left (north) onto Fall Creek Road (FS 722). Follow FS 722 until it forks, and take the left (west) fork. At approximately 0.7 mile, FS 722 crosses over Fall Creek. Park beyond the creek. The first level of Fall Creek Falls is visible from the roadside. The first level of Fall Creek Falls is visible from the roadside. This 70-foot tumble through a laurel choked gorge is on King Creek. After a moderate 30-minute hike, you will reach a spot where you can relax all day long and enjoy the spray from the falls. Perhaps it is the backward slant of the rocks, but in any case the drop appears to be much higher than 70 feet. Directions: From Walhalla, drive northwest on SC 28 for approximately 8 miles and bear right (north) onto SC 107. Drive 10.4 miles and turn left onto Burrells Ford Road (FS 708, paved for the first 0.3 mile). Drive approximately 3 miles to the parking area on the left. Hike the Chattooga Trail (gravel) that begins at the southern end of the parking lot. Follow it 0.3 mile past the last campsite on the right side of trail and just north of King Creek. Take the first left (east) by the north bank of the creek. Proceed 250 yards and cross the bridge. Turn left (east) onto the trail to the waterfall. Climb the wooden steps, and follow the trail to the waterfall. The 2-hour journey is quiet an effort to reach the 50-foot Opossum Creek Falls. However, reaching the falls could rank among your most rewarding waterfall excursions, or the most difficult. Most of the 2-mile hike ambles along a pleasant trail shaded by an assortment of hardwoods and bordered at times by small partridgeberry wildflowers. But when you reach the Chattooga River, you will turn left onto a heavily vegetated path and scramble around rocks and trees for a half- mile hike to the base of the waterfall. Directions: From Westminster, drive west 13.3 miles on US Highway 76 and turn left onto Damascus Church Road (County S-96). Drive 0.9 mile and turn right onto Battle Creek Road (County S-102). Drive 1.9 miles and turn right onto Turkey Ridge Road (FS 755). Drive 2.3 miles to FS 755F on the left. Park. Walk back up FS 755 to the trail one right and hike about 1.5 miles to the end of the trail where Opossum Creek enters the Chattooga River. Turn left and cross over a downed log. Continue upstream on Opossum Creek about 0.5 mile to the base of the waterfall. This stubby 12-foot high waterfall is on the Chauga River. On some rivers, this broad, 100-foot-wide cascade would probably pose just a brief obstacle to whitewater paddlers. But don't let that sway you. The moderate 45-minute hike along a recently constructed trail is worth your hiking time. Directions:From Westminster, drive west 7.5 miles on US Highway 76 and turn right onto Cobb Bridge Road (Oconee County S-37). Drive 1.6 miles; turn left onto Spy Rock Road (FS 748, graveled). Drive 1.8 miles to FS 748C (on the right) and park by the side of the road. Hike east on FS 748C for 0.3 mile to the trail and hike 0.7 mile to the waterfall. Station Cove Falls, a stepped 60-foot waterfall forms from headwaters atop Station Mountain. An easy, 30-minute hike through a gorgeous Appalachian cove takes you to the waterfall. In the spring and summer, countless wildflowers bloom along the trail. You may see trillium, may apple, pink lady's slipper orchids, bloodroot, and redbud. Directions: From the intersection of SC Highway 11 and SC 183, drive 1.5 miles north on SC 11 and turn left (northwest) onto Oconee Station Road (County S-95). Drive 2.4 miles to trailhead on the left. Parking is limited to 4 cars. The 0.5-mile hike begins behind the bulletin board. (County S-95). Drive 2.4 miles to trailhead on the left. Parking is limited to 4 cars. The 0.5-mile hike begins behind the bulletin board. Set back into a hillside and surrounded by an explosion of shrubbery, Spoonauger Falls runs down a stepped rock face in a broad sheet. The 50-foot high waterfall is among the more popular in this area of the Chattooga River Watershed, no small part due to the easy, 20-minute hike. Like its cousin, King Creek Falls, this waterfall is camera-friendly, especially in the summer when plants snake all about and afternoon light highlights the innumerable horizontal slashes of the rock. Directions: From Walhalla, drive north 9.5 miles on SC Highway 28 to the junction of SC 28 and SC 107. Bear right (north) onto SC 107. Drive 10.4 miles and turn left onto Burrells Ford Road (FS 708, paved for first 0.3 mile). Drive about 3 miles to the Chattooga Trail parking on the left (look for bulletin board). Hike the trail north, which roughly parallels the Chattooga River for 0.25 miles and cross Spoonauger Creek. Follow the directions posted to reach the waterfall. A moderately difficult out-and-back trail leads you to the base of a spectacular 50-foot vertical cascade. After a short hike on the Yellow Branch Nature Trail, you will come to the junction with the Yellow Branch Falls Trail. You will pass through groves of dignified hardwoods and cross meandering creek bottoms before turning to circumnavigate the steep terrain. In the winter when the trees are bare, you can see the Walhalla vicinity as you hike. Wear sturdy shoes and use extra caution during wet conditions as the trail skirts the edges of deep ravines. Conversely, if it hasn't rained for some time, the falls may be just a trickle of water over a series of ledges. Directions: From Walhalla, drive west 6.8 miles on SC Highway 28 and turn left into Yellow Branch Picnic Area. Hike 0.2 mile on the Yellow Branch Nature Trail to the Yellow Branch Falls Trail. Hike 1.3 miles to the waterfall. The Andrew Pickens District of the Sumter National Forest is home to 15 waterfalls raging in height from a stubby 12 feet (Riley Moore) to a majestic 75 feet. Hiking to these waterfalls ranges from easy to moderate to difficult to extremely difficult.